I begin most mornings reading national newspapers online. What looked like just another story about crowdsourcing on the Internet turned out to be one of the most creative and humanly compelling change strategies I’ve ever seen. Ironically, I’ve been working on a piece on the importance of individual heroics in our flat and networked world. Jason Russell’s film KONY 2012 takes that message and breathes far more life into the importance of the subject than where my words were heading. Russell’s quest is to raise the crimes of African war lord Joseph Kony on innocent children into our daily conversation. It’s not a liberal sob story. It’s a brilliant saga that’s 27 minutes long and totally riveting. How often do you get to see Oklahoma Republican Jim Inhofe and George Clooney on the same side of the table? Stop reading and click the above link now. I’m serious. Pencils down — No reading until you watch KONY 2012. What follows makes marginal sense until you do. Russell’s film captures the essence why heroic acts inspire and hold us accountable to our highest self. Kony 2012 is a heroic story that invites viewers to step up. That’s why heroics are so important. It is so easy to slip into the middle of life’s river and drift with familiar routines. Heroic actions remind us that not only can we do better; we have an obligation to try. Russell and his colleagues actions show us how it’s not super-heroes, but the aggregation of small and large heroics that morphs the impossible into reality. Harness the time and passion of younger generations to capture the hearts and dollars of current power brokers: Do you have more discretionary time than a high school or college student? Make sharing your passion easy: Invisible Children’s kit for supporters includes two bracelets: one for you and one to give a friend. The apex of Russell’s strategy is a call to action entitled “Cover the Night”. 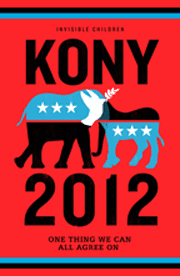 The idea is during the night of April 20, 2012 to paper the world with “Kony 2012” posters, bumper stickers, web objects, etc. such that when people wake up on Saturday morning, they can’t help but ask, “What is Kony 2012”? It’s a brilliant twist on the campaign signage that dominates our political season. As of this morning, the Invisible Children’s Facebook page had 2.5 million likes. That’s impressive yet with Facebook’s total membership over 650 million, it represents less than 1%. I tried to purchase the Action Kit from Invisible Children’s website and was disappointed (and pleased) that it was sold out. Bracelets are on their way. I got up this morning intending to finish my piece on the imports of heroics. Jason Russell did a much better job.